Function:Turn frontward and backward, turn left and right. The big arm rise and down.The small arm rise and down. The excavator bucket rise and down.Rotate 680 degrees.The lamp before and after light up with simulation sound.Joint activities independently. 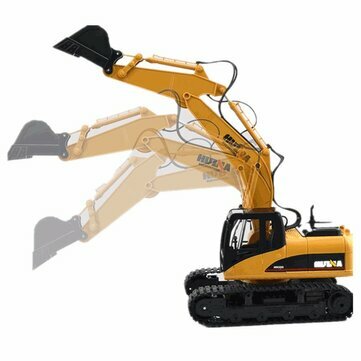 1.Irrespective of the size and other physical attributes, the fact that this RC bulldozer toy can really work like the real thing is the most amazing aspect of these models. 2.Enough power to support Climbing effortlessly.Bucket,cab and wheel are all made of hard metal.Rubber Wheels,Increase the thickening of the rubber wheel,more slippery wear-resisting. 3.Dual lock type external charging. For English Instructions, please click here.